T-Stroke® is the Revolutionary ‘NEW’ Putting Training Aid from ARC Golf Concepts. It’s a training aid that delivers enhanced alignment, rhythm and connection delivery and a better golf ball roll. 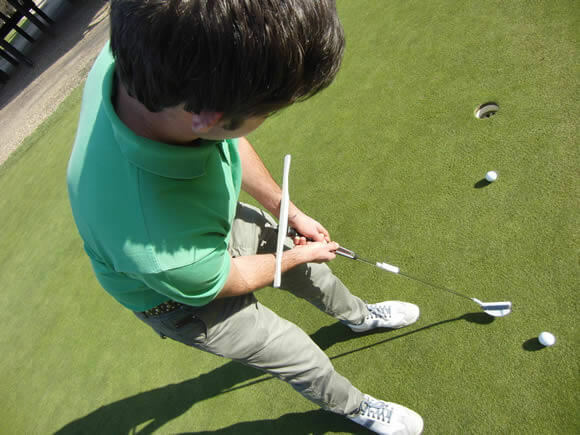 T-Stroke is effectively an alignment bar that, whilst attaching to the top of the putter, rests on the forearms. This simple alignment tool, creates the optimum bio-mechanical angle between the putter-shaft and the forearms allowing the arms to hang naturally from the shoulders and sets the forearms and shoulder alignment squarely to the target-line! If T-Stroke feels strange in the first instance, it is highlighting faults in your address position. If it feels comfortable, it is re-enforcing your good habits and these should be practised to ensure you maintain these critical fundamentals. Endorsed by 2012 HSBC Abu Dhabi Champion Robert Rock, T-Stroke perfects your set-up position and consistency of the putter-face during your putting stroke!